1. Put rice in water and let it soak for an hour. Then drain away the water and keep aside the rice. 2. Cut chicken into big pieces. Make slits on them. 3. Take all the ingredients mentioned above for marinating the chicken and mix them well. 4. Now, marinate the chicken in this mixture and leave for an hour. Alternately, you can prepare this the previous day and put it in a refrigerator. 5. Fry the chicken lightly adding salt, in oil. 6. Put 2-3 tsp of ghee in a thick bottomed pan and heat it. 7. Add cinnamon, cloves and cardamom to the ghee and stir it for a few minutes. 8. Take the soaked and drained rice and add it to this ghee. Fry it for 10 mins. 9. Add water and 1 tsp of salt to it. 10. Cook it over a high flame and cover the pan with a lid. 11. After some time, when there is no more water visible on top of the rice, open the lid and stir the rice. Take care to ensure that the entire rice is mixed well. This is done to avoid burning the rice at the bottom of the vessel. 12. Once the entire water has evaporated, remove the rice from heat and cool. 13. Put a little ghee or oil or both in a pan and heat it. 14. Add green chilli, garlic and ginger to this and saute. 15. Next, add onions and fry. 16. Add chilli powder, coriander powder and salt and saute once again. 17. Add curd and mix well. 18. Then add the chicken pieces along with the marinade. 19. Cover the mixture and cook for 10 mins. 20. Next, add big tomato slices and 1/2 tsp salt and cook covered till the gravy looks like a paste. 21. Fry raisins, cashews and mint leaves separately in ghee and keep them aside. 22. Take a big wide vessel. Just coat it with butter or ghee. 23. Arrange the chicken and the cooked rice into layers. First layer should be that of chicken and the topmost layer should be that of rice. Mix rose essence and yellow colour powder and sprinkle it on top of the rice carefully. Take one tsp of ghee and sprinkle it on top. Sprinkle the fried leaves followed by fried cashews and raisins. 24. Next, cover the vessel with a lid and heat it over a low flame for 20-25 minutes placing it on a tawa. 25. The biryani is ready to be served. 26. Serve the biryani with raita. 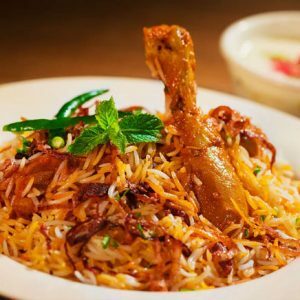 Feel free to comment or share your thoughts on this Kerala Style Chicken Biryani Recipe from Awesome Cuisine.